Accuride had an IBM iSeries-based electronic data interchange (EDI) solution that required frequent attention from IT personnel and was expensive to operate. The company used the Microsoft application platform to build a new solution that not only improves integration, but also streamlines production planning and provides customers visibility into certain manufacturing processes. Developed in four months with assistance from SPR, the solution has improved factory operations and delivers new customer value. Accuride is realizing technical benefits as well, including high developer productivity, minimal deployment costs, reduced ongoing costs, and a decreased IT workload. Furthermore, the solution’s scalability, reliability, flexibility, and ease of management will help Accuride take advantage of the solution in the future. Accuride Corporation designs, manufactures, and distributes components for trucks, trailers, military vehicles, and construction vehicles. The company’s products include wheels, wheel-end components and assemblies, truck body and chassis parts, seating assemblies, and other commercial vehicle components, which Accuride markets under the brands Accuride Wheels, Gunite, Imperial, Bostrom, Fabco, and Brillion. Invalid or incomplete data. Incoming EDI messages were often inaccurate, with missing part numbers or invalid part combinations. IT staff had to intervene to resolve such issues, and all troubleshooting had to be done on the iSeries. High costs. The cost of supporting the EDI solution was steep—in part because incoming files were large and were transmitted through a value-added network. Difficult changes. Changes to the EDI system, such as defining custom business rules or adding support for new trading partners, took several hours to implement and presented additional risk to an already fragile platform. However, Accuride had to do more than just solve its integration challenges. 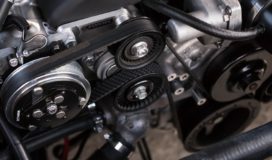 The company had acquired an Assemblies-on-Time (AOT) facility at which Accuride wheels are joined with tires, valve stems, and other components to create finished wheel assemblies. It needed a new production scheduling application to support the migration of the AOT facility to BPCS, which didn’t include the needed production scheduling functionality. In addition, Accuride had to provide customers that rely on those facilities with visibility into the status of orders, inventory levels, and shipments. A service bus that validates incoming EDI messages, orchestrates corrections to those messages, and moves data in and out of the company’s production-planning and enterprise resource planning (ERP) systems. This component is based on Microsoft BizTalk® Server 2006 R2, the second release of BizTalk Server 2006. An intranet site based on Windows® SharePoint® Services. The site hosts Microsoft Office InfoPath® 2003 forms that make it easy for business users to correct any errors in incoming EDI messages. A scheduling application that production planners use to fine-tune production schedules after the EDI messages are received and validated. The scheduling application is based on Microsoft ASP.NET. An extranet site, also based on Microsoft ASP.NET, that exposes data in BizTalk Server, the scheduling application, and the ERP system for access by customers over the Web. All four components were developed using the Microsoft Visual Studio® 2005 Professional development system, run on the Windows Server® 2003 operating system, and use Microsoft SQL Server® 2005 data management software for data storage and reporting. Loose coupling. BizTalk Server 2006 R2 supports a flexible, loosely-coupled approach to integration, which simplifies how messages are transformed, processed, and ultimately passed on to other systems. Adapter framework. The BizTalk Server 2006 R2 adapter framework provided prebuilt plug-ins for integrating with most other systems—in a manner that wouldn’t require extensive custom development. Native EDI support. The BizTalk Server 2006 R2 mapper, which is used to specify how incoming and outgoing messages are transformed, includes native support for common EDI documents. Developers can generate transformation maps just by selecting the appropriate EDI document and using the mapper’s graphical interface to specify how those messages are converted to a canonical, XML-based internal format. Reliability and scalability. The publish/subscribe model used by BizTalk Server 2006 R2—in which messages to be acted upon are stored in a common message box—provides a high degree of reliability. Similarly, the host-based architecture of BizTalk Server 2006 R2 enables an organization to scale the solution easily as EDI traffic grows, just by adding servers. Figure 1 shows how Accuride is using BizTalk Server 2006 R2 to support the production-sequencing process—the first of many such EDI transactions it plans to support. Each transaction passes three stages of processing (receipt, validation, and delivery), which are loosely coupled to facilitate ease of maintenance, changes, and future enhancements. Validation. Transformed messages are validated through a set of global and trading partner–specific rules, which are implemented using a combination of the BizTalk Server Business Rules Engine and Web services. If the solution detects errors, it uses the SharePoint adapter for BizTalk Server to route the canonical documents to a Windows SharePoint Services document library. Windows SharePoint Services alerts business users when such a message is detected, at which time the business users can use Office InfoPath forms to view and modify the data in the message. BizTalk Server watches the document library for such modified messages and, when one is detected, picks it up and revalidates it. Delivery. Validated messages are then delivered to the appropriate back-end systems. In the case of production sequencing documents, BizTalk Server places the documents in the SQL Server 2005– based database that supports the scheduling application. 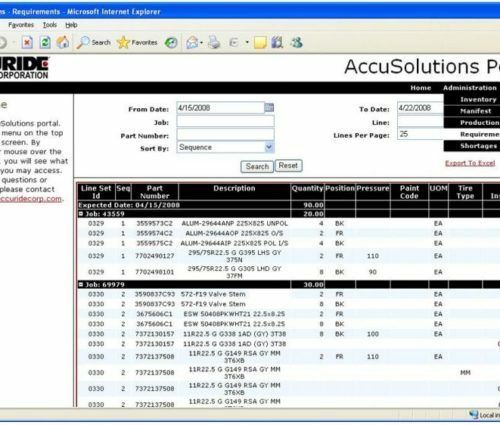 In developing the scheduling application, Accuride took advantage of SQL Server 2005 Reporting Services to deliver several printer friendly reports for production planners. Reports containing data from both the application’s own SQL Server–based database and the DB2 database for the ERP system are available, as are reports that utilize data from both systems to show, for example, inventory shortages against production requirements. (The reporting capability achieves integration with the ERP system through SQL Server stored procedures, which in turn call the DB2 database on the iSeries.) Another report shows any data validation or processing errors detected by BizTalk Server. BizTalk Server 2006 R2 runs on two HP ProLiant BL25p G1 blade server computers, each configured with one dual-core processor and 2 gigabytes (GB) of RAM. Failover capabilities are provided by the BizTalk Server host-based architecture. The Microsoft ASP.NET scheduling application runs on two load-balanced HP ProLiant DL380 G3 server computers, each configured with one dual-core processor and 2 GB of RAM. The AccuSolutions extranet portal resides on one HP ProLiant BL25p G1 server computer, which is configured with one dual-core processor and 4 GB of RAM. All components are supported by an HP ProLiant BL25p G1 server computer running SQL Server 2005, which is configured with one dual-core processor and 4 GB of RAM. All of the above systems are supported by an HP StorageWorks EVA 4000 storage area network (SAN). The extranet servers use trusted Web services to communicate with the database server through the company’s firewall. The company will use its new solution to support other aspects of doing business electronically as well. “I can envision expanding our use of BizTalk Server to support all aspects of e-commerce, such as bank submissions and Automated Clearing House transactions,” said Stefanich. By choosing to build its new solution on Microsoft software, Accuride was able to meet all its needs quickly and cost-effectively, working in a single programming framework and tool set that enabled the company to take advantage of existing developer skills. “The Microsoft application platform gave us everything that we needed to build the solution, including powerful integration and business process orchestration tools, comprehensive data management and reporting, and a full-featured Web and portal environment. And all those capabilities were accessible through a unified, highly productive tool set,” said Stefanich. Lower EDI-related costs. By moving off the prior platform the company is incurring a savings in EDI-related, third-party support costs.